AT A time when the Centre was expecting a bumper crop of food grains, unseasonal rainfall accompanied by gusty winds and hailstorms has destroyed large tracts of standing rabi crops, forcing farmers to commit suicide. Farmer leaders say more than 100 farmers have taken their lives over debt worries in the past one month. The freak weather event, which began towards the end of February and continued till March, swept across northern and western India. Though the Union Ministry of Agriculture is yet to ascertain the extent of crop damage, a highly-placed official confirms that the rains have substantially hit crop production for the year and could push food prices up. Maharashtra, Madhya Pradesh, Punjab, Haryana, Uttar Pradesh, Rajasthan, Uttarakhand and Andhra Pradesh are the affected states. The unseasonal rains battered the fields just as farmers were getting ready to harvest rabi crops such as wheat, pulses, potato, sugarcane, maize, groundnut and mustard, and horticultural crops like grapes, papaya, mango, banana, onion and other vegetables. B K Bandyopadhyay, deputy director general of meteorology at India Meteorological Department (IMD), attributes the weather event to Western disturbances—an extratropical storm originating in the Mediterranean that brings sudden winter rain and snow to the northwestern parts of India. “We had given timely forecast for the rain. However, we cannot forecast hailstorm which has caused maximum damage to crops,” he says. “Most parts of Madhya Pradesh and Vidarbha, Marathwada and Sangli regions of Maharashtra are the worst hit,” he adds. According to a senior official at the agriculture ministry who did not wish to be named, rains and hailstorms have destroyed nearly 3 million hectares (ha) of crops in Madhya Pradesh and Maharashtra alone. “This has triggered suicides by farmers. We have already received reports of about 45 farmers committing suicide in the past one month,” he says. “We plan to disburse around Rs 1,350 crore as compensation to affected farmers in these states. This will be done only after we receive the results of crop-cutting experiments in May-June.” Under the crop-cutting experiment, different crops are grown on randomly selected patches in affected areas. Compensation is granted on the basis of the average yield of these patches. While the Centre is slow in assessing damage to crops, several affected states have gauged the extent of crop loss and announced relief. Madhya Pradesh Chief Minister Shivraj Singh Chouhan has described the rains and hailstorms as a national calamity. Farmers in the state have lost crops worth Rs 13,000 crore. The erratic weather has damaged 2 million tonnes of wheat, 1 million tonnes of gram, 300,000 tonnes of lentil and 150,000 tonnes of other crops in some 30,000 villages, he said. As an immediate relief measure, he has announced supplying wheat and rice at Rs 1 per kg to all affected farmers. A senior official at the state agriculture department told Down To Earth that the government will give compensation of Rs 15,000 per ha for damaged crops. “While, the Centre has no provision for compensating farmers who have suffered between 25 and 50 per cent of crop damage, the state will compensate them as well,” he says. The Maharashtra government estimates that over 1.9 million ha of crops have been ruined by the freak weather event. “The state has been witnessing the unseasonal weather since February 22,” says Kishore Tiwari, farmer leader and chief of Vidarbha Janandolan Samiti. “It has affected 28 of the 35 districts causing huge loss to farmers. In Vidarbha alone, 17 farmers have committed suicide while the number is 36 in Marathwada and 35 in the remaining region. The regional media has reported 101 farmer suicides,” he adds. The Maharashtra government has announced a compensation package of Rs 35,000 crore. Farmers growing rain-fed crops will receive Rs 10,000 per ha, while those depending on irrigated crops and perennial orchard crops will get Rs 15,000 and Rs 25,000 per ha, respectively. The compensation will be limited to 2 ha per farmer. The government has also declared waiving electricity bills of the affected farmers from January to June 2013, which amounts to Rs 200 crore. Banks have been instructed to suspend recovery of agricultural loans till the end of this year. The loan interest, which amounts to another Rs 268 crore, will be borne by the government. Families of the 43 farmers who committed suicide in the state following the catastrophe will receive Rs 1 lakh in compensation. Rajasthan, Punjab, Haryana and Uttar Pradesh have also reported crop losses, but officials say they are waiting for the crop-cutting experiments to ascertain the damage. Rajender Solanki, additional director of the Haryana agriculture department, told Down To Earth, the state grows wheat on 2.5 million ha and mustard on 500,000 ha. “The rains have surely played havoc with the mustard crop that was ready for harvest. Its pods have fallen due to rains and hailstorms. Wheat plants are lying flat on the ground. The production is likely to reduce by around 200,000 tonnes,” Solanki says. He further says that the state government has asked the revenue department to assess the damage. It is getting delayed due to the upcoming Lok Sabha and Assembly polls. In Punjab, wheat crop is ruined in Gurdaspur, Mohali, Ferozepur, Tarn Taran and Nawanshahar. The situation in Rajasthan is equally precarious. 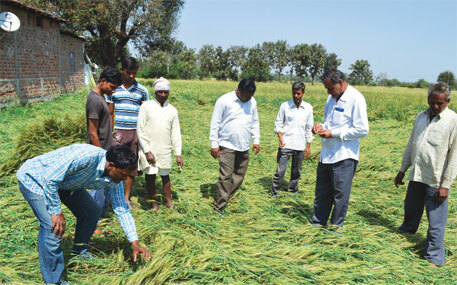 The southern district of Baran experienced 80 per cent crop damage, while the damage in Kota is pegged at 60 per cent. The western districts of Sikar and Jhunjhunu have lost up to 70 per cent of their crops, including maize and vegetables. Chief Minister Vasundhara Raje has directed the disaster management department and district authorities to submit assessment reports on standing crops of wheat, mustard and millet. In Uttar Pradesh, 70 per cent of the wheat, potato and chilly crops have been damaged in Ferozabad, Agra, Mathura and Etawah. The remaining potato crop is sure to rot because of moisture. Contrary to the claims of the state and Central governments about the benefits of crop insurance schemes, the schemes are not likely to provide immediate relief to the farmers battered by unseasonal rainfall and hailstorm in March. Farmers usually insure themselves under the Modified National Agricultural Insurance Scheme (MNAIS) or the Weather Based Crop Insurance Scheme (WBCIS). MNAIS protects farmers from sowing or planting risks and post-harvest losses. The scheme also provides protection against calamities like hailstorm and landslide, provided the government declares them national calamity. A farmer seeking bank loan must join MNAIS. WBCIS, on the other hand, is based on the fact that weather conditions affect crop production even when a cultivator has taken all the care to ensure good harvest. Farmers pay the premium depending on the protection offered for a calamity. Sources in the crop insurance sector say most farmers do not extend their insurance schemes to cover hailstorm. Only a few thousand farmers, mostly those covered under MNAIS, have insurance coverage for hailstorm. While a large number of farmers in Maharashtra have hailstorm coverage, the number is negligible in Madhya Pradesh, Rajasthan, Punjab and Haryana. Even these farmers are not likely to get timely benefit from the scheme because most crop insurance settlements are based on crop-cutting experiments. Though the experiment begins in April-May, settlements are done only after the insurance companies receive reports from the government that conducts the experiment across the country every season. who have generally borne the brunt of extreme weather in the past few months like excessive rains, floods and hail storms. That too from a state that has the commercial hub of the country as its part.. can we individuals in our own way help these farmers by any means?? can we get some source of stable income for them?